Here’s Day 7 of The Our Lady, Undoer of Knots Novena! During the Novena to Mary Undoer of Knots I prayed that my daughter would attempt to contact her dad & I. She did contact us Sunday. Thank you Jesus, Mary, & Joseph. I was also praying that my husband’s brother would try in someway to contact my husband (his brother). There is very much discourse in their relationship. He did mail some papers my husband had asked for several months ago concerning family matters. No attempt on the brother’s part to try to heal any wounds. But thank you Jesus, Mary, & Joseph for this step in healing for my husband. Please undo the knot of loneliness that I may meet a man to share my life with who has faith and is supportive and loving. Addiction is so harmful to the physical, mental and spiritual heath of all those who are addicted, and the families and friends of the addicted. Blessed Mother Mary, Undoer of Knots, please hear our prayers for those addicted and all those around the addicted. I know how difficult it is to overcome that need for an excess of something, many times something very harmful. Mother Mary, please help the addicted to see and understand the power of God Our Father, of Jesus our brother and Savior, of the healing power of the Holy Spirit. Please untie the knots that tie them up. Let one of your blessed children near to them help them to see the Way. Please undo the knots that are blocking my family and me from accomplishing the will of God for our lives in ALL areas. 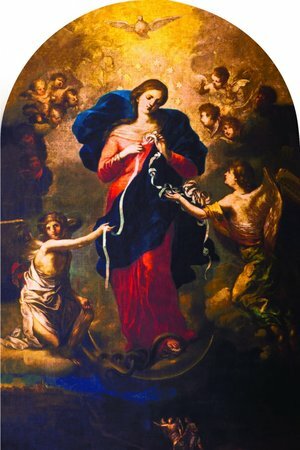 O Mary, my mother and undoer of knots, please unsnarl the knot of anger, bitterness and despair in my wife’s heart, and have her be filled with the Holy Spirit who will fill her with joy and peace. Amen. I pray for a miracle. To be saved from my self destructive behaviors and the consequences I am faced with at the moment. Mary lady of knots untie all knots that are blocking my relation untie them and let your will be done in my life today and forever you know my problems now and my needs I offer them to you today. For Mark’s Healing. Please let the stem cell treatment become available for his sickness. Linda, Linda Jr. and my very special need. Thank you Dear Mother in Jesus’s Name. untie the knots in my whole family , bless me with financial security. and bring peace love & joy back to this family.